This week's #beertography comes to us from @jcshithead and continues with our recent theme featuring Barcade Jersey City. The beer is Flying Fish Bourbon Barrel Aged Abbey Dubbel which is quite highly rated. This one is currently still on tap as of today so I might have to stop in and have one myself. 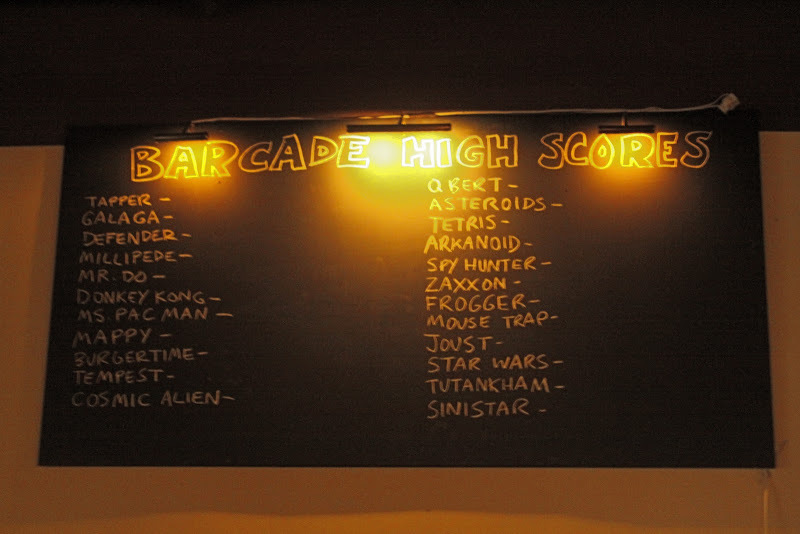 Barcade JC has also just recently put their food menu online and it looks phenomenal. Check it out here. The words bacon and nutella in the same menu item alone should be enough to get you there. Barcade Jersey City may be opening officially to the public on Friday, but we were lucky enough to be invited to attend Grand Pre-Opening to give the new place a test-run. Here is some pre-beertography for you all to enjoy. 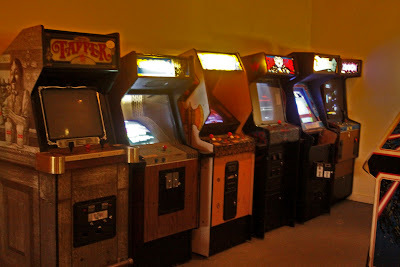 Be sure to go check Barcade out for yourselves this weekend. I know I'll be back sooner than later. If you're familiar with the Brooklyn location, you practically already know the JC location. The design is much the same, and why shouldn't it be? If it ain't broke..
Nice sized crowd and a lot of familiar faces from the Brooklyn digs. Not to mention the NJ beer crowd. Worlds collide. That's a table game of Pong in the foreground. Its not working right now, but hopefully will be soon. The awesomely open front of the bar. A lot of the windows open as well. Should make for excellent Summer evening drinking. Barcade JC has food! Here's the little portal to the kitchen area. The chefs last night were preparing small bread, cheese and pickle plates along with some deviled eggs and other small bites. No word on whether or not they'd be actual menu items or not. This weeks' #beertography comes to us from Jim Frasch (@JFrasch) and features the elusive and highly-regarded 2011 Founders KBS (or Kentucky Breakfast Stout). This stout is brewed with a hint of coffee and vanilla then aged in oak bourbon barrels for over a year. At 11.2%, this is a slow-sipper. But you'll want to take your time anyways as even if you've been able to find it, because its just that good. I took a chance and stopped at Bottle King in Glen Ridge, NJ. Asked one of the employees he had no idea what I was talking about. He disappeared into the back room, and emerged 5 minutes later w/ 1 bottle, wouldn't let me have more than that. I joked with the cashier about buying insurance for it, and she said "oh, so this the special one they just told us about". I've heard a lot of similar stories of KBS findings in NYC and NJ. Most places knew what they had and enforced a 1 bottle per person limit, while a few others did not and let people walk out with an entire case. Chances are 99% of the bottles that made it to our area are gone by now, but there are probably still kegs around. Just this past week, The Iron Monkey in Jersey City tapped 2 kegs of KBS. If you haven't had this beer yet, definitely keep an eye out. ALSO! 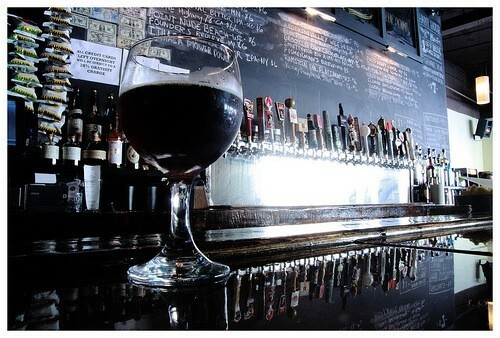 You can now submit your beertography directly through Twitter. Just tag your photo with #beertography and i'll select the best to feature on the Beertography of the Week. If you prefer to email it, its beertography@gmail.com. 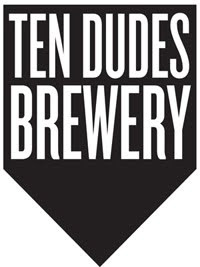 If so inclined, you can also now follow our homebrewings on twitter via @tendudes. 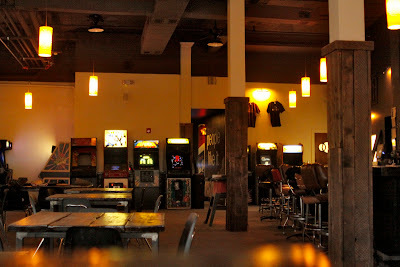 Barcade Jersey City: Open Next Week! Well kids, the time has finally come. 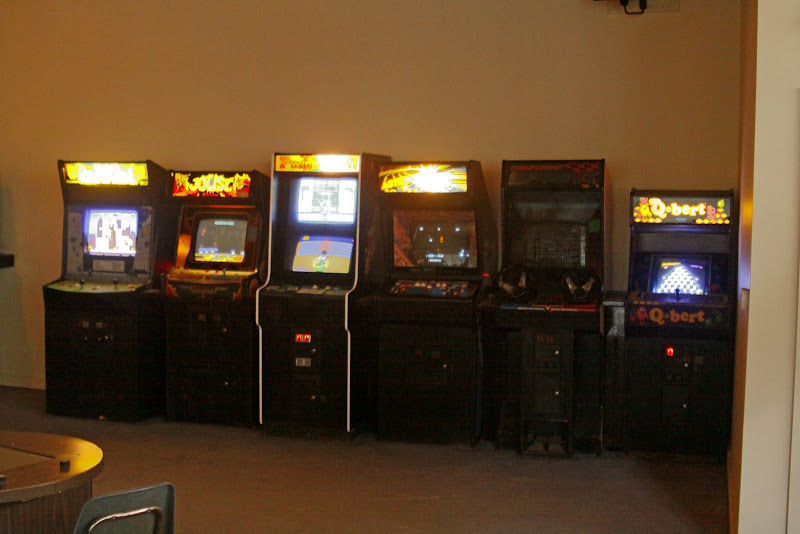 Barcade's Jersey City location is finally opening. For those unfamiliar with the original Williamsburg, Brooklyn establishment, you're in for a real treat. Barcade is just what it sounds like: Bar + Arcade. The twist being that all of the beer is craft beer and the games are all cabinets from the 1970s and 1980s only. So don't expect to be drinking a Budweiser while playing some Mortal Kombat. 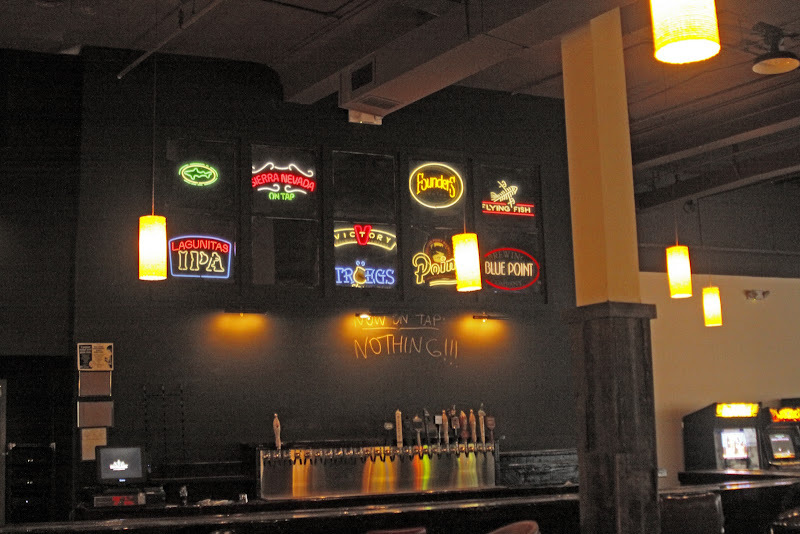 Here you'll be drinking high-quality brews and playing vintage video games. - 163 Newark Avenue at Barrow St. The Game List: Tapper, Galaga, Defender, Millipede, Mr. Do, Donkey Kong, Ms. Pac Man, Mappy, Burgertime, Tempest, Cosmic Alien, QBert, Asteroids, Tetris, Arkanoid, Spy Hunter, Zaxxon, Frogger, Mouse Trap, Joust, Star Wars, Tutankham, Sinistar (this is give or take a few, due to repairs). 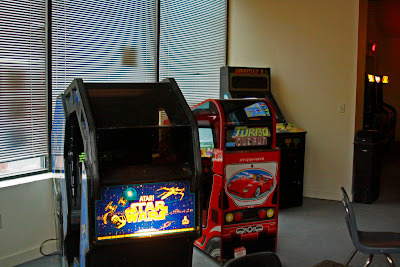 As you can see, with the slightly bigger space they're able to have some cockpit-style games like Star Wars and Turbo OutRun. Well, there you have it! 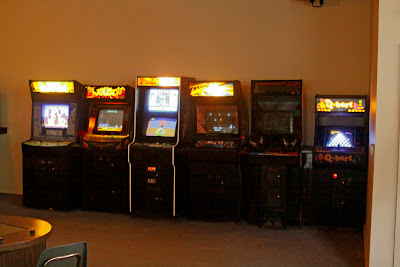 Barcade JC should be open some time next week, so hope to see some or ALL of you there. Big thanks to Paul for letting me check out the new space. This week's BOTW comes to us from the folks at BeerUnion, a great NYC/Boston Beer Blog. Those with a keen eye may have been able to tell right away what the photo is, but for those who cannot, this is a comparison tasting between Founders Brewing KBS 2010 and 2011. Upon comparing the 2010 and 2011 versions we found that they were a bit different. Founders may have tweaked the beer a little and it made it even better. 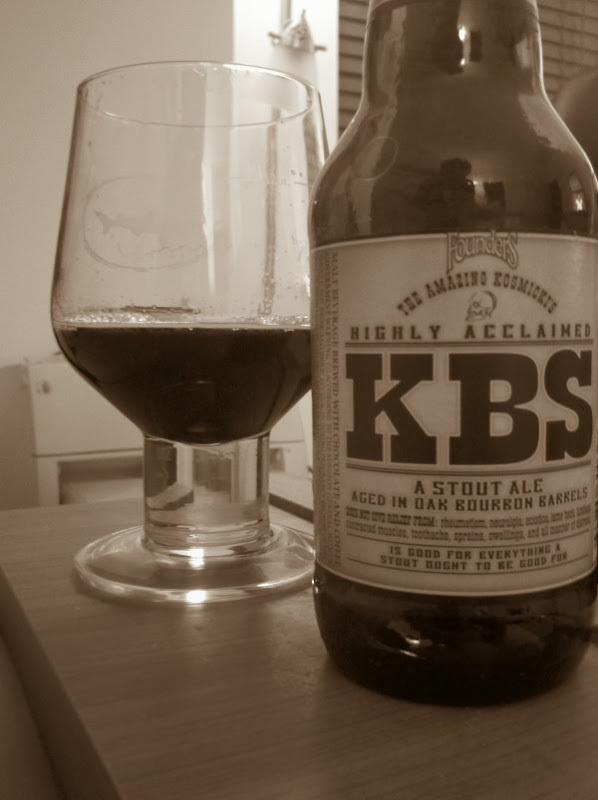 We had heard some complaints last year that the bottled 2010 KBS was too carbonated and found that the 2011 was noticeably less carbonated and had a more silky mouthfeel. The chocolate, coffee and of course the bourbon are present in both versions. We thought the 2010 could still use more aging while we thought the 2011 was ready to drink right away. Glad to hear the 2011 is delicifying (that's a word, right?) right away where the 2010 might still need some time to sit. I've actually got 1 remaining bottle of 2009 sitting around that I may just have to cracked and do a three year vertical. Then I will curse myself a year from now for not having the '09 anymore once the '12 is here. Thanks again BeerUnion! Make sure you follow their blog. And if you have any fun/cool beertography you'd like to submit, send it to beertography@gmail.com and maybe we can feature you're great shot. Cheers. 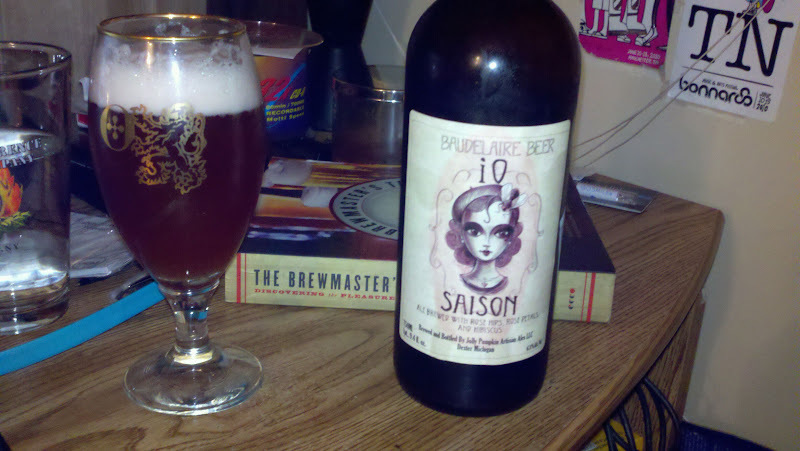 This week's Beertography comes to us from @firstladyofbeer and features a bottle from Jolly Pumpkin's Baudelaire Series, namely the iO Saison. According to beernews.org, the iO is brewed "with rose hips, rose petals, and hibiscus. ABV is 6.8%". The Brewmaster's Table by Garrett Oliver, Captain Lawrence pint glass, Ommegang Goblet, bonus points for the Bonnaroo sticker! Cheers @firstladyofbeer and thanks for the submission! If you took a great shot of beer, why don't you submit it?? Send it over to beertography@gmail.com today!